Steyr Mannlicherâ€”or Steyr Arms as it's also come to be knownâ€”has been turning out quality firearms since its inception in Austria in 1864. Those familiar with the Steyr name know it's synonymous with the legendary Steyr AUG (Armee-Universal-Gewehr) or Universal Army Rifle. The company has transferred those many years of firearms knowledge and craftsmanship into its pistol line, making it affordable for the all shooters to own. Steyr currently produces C-A1, S-A1, M-A1 and L-A1 pistol series, the latter being the newest in the lineup. The L-A1 is essentially a long-slide version of the M series with a standard size grip and 4.53-inch barrel. In 9mm Luger guise as the L9-A1, it utilizes a 15-round magazine and plus-two floorplate for a total capacity of 17 rounds. Two magazines are included. Additional calibers include .40 S&W and 9x21 (on request), and rumor has it the .357 SIG may be added in the future. The features are plentiful, starting with the L9-A1's unique but optional triangular trapezoid sights, which are no-snag and low-profile for effective concealed carry. The slide has cocking serrations located on both sides for those who like to conduct press checks, and the barrel axis is low to the frame to help reduce muzzle jump. The L9-A1 has three loaded-chamber indicators, which are located at the rear of the slide, top rear of the barrel and a protruding extractor. The frame has many extras as well, the first being the "limited-access" lock that doubles as the takedown button. By inserting one of two supplied keys into the lock and turning counterclockwise (toward the S stamped into the frame, with the twin tool-access indents oriented horizontally), you can deactivate the triggerâ€”an action that also prevents disassembly. With the lock in F position (indents vertical), the gun is in shootable condition and can be disassembled. After removing the magazine and clearing the chamber, release the slide and pull the trigger. While pressing down on the limited-access lock button, push the takedown lever down. You can use your finger to hold the lock button in, although if you have large fingers you may find the key or similar tool will make things easier. Push the slide forward and remove the recoil spring and barrel. The frame sports an accessory rail for mounting your favorite gear. There are also molded serrations on the front of the trigger guard and on the front and rear of the grip as well. A cut-out is molded into the frame on both left and right sides for indexing your trigger finger. 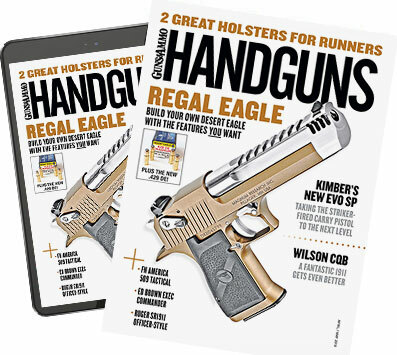 The magazine release is ambidextrous and can be changed easily by the user. The L9-A1 is very controllable and comfortable to shoot, even for someone with large hands. The drawback to any polymer frame is you're subject to the manufacturer's vision of comfortable, but Steyr has made it feel universal. The angle of the grip does make the L9-A1 very pointable and easy to bring back on target during rapid fire. The frame also houses the steel block that contains the working parts of the L9-A1. This in itself is not new, but it does allow for a lighter pistol while maintaining its integrity. Range time allowed me get used to the L9-A1's unique sights, and I was able to produce consistent groups at 25 yards with five different types of defensive and target ammunition. HPR's 124-grain hollowpoint gave the best performance, followed by Winchester's 115-grain metal case. All the groups were tight enough to fit under my hand, although I found it shot high and left. Adjustable triangular trapezoid or night sights would be a welcome option on future models. I understand that certain compromises must be made to produce an affordable firearm, but I don't think the trigger should be one of them. I felt the trigger on this particular L9-A1 had too much creep before the release. A smooth, crisp trigger would make the pistol a bit more user friendly. The L9-A1 ate a steady diet of factory ammo and various reloads without a single pistol-related stoppage. That's as it should be if it hopes to fill the defensive or duty pistol role. I'm enthusiastic about the potential .357 SIG offering because the L-A1's full-size frame will be a good fit for such a potent caliber. However, Steyr's PR rep believes this chambering is going to be a ways down the road for the U.S. market. As for the .40 S&W version, it should be available soonâ€”possibly as early as the end of 2013 but more than likely the first part of 2014. But the 9mm is here, and if it's a caliber that suits your fancy, check your local dealer for the L9-A1. It's an affordable, shootable and reliable autoloader. What more could you want?